Published: Nov. 1, 2018 at 08:50 p.m. Updated: Nov. 2, 2018 at 12:47 p.m.
Ben Roethlisberger's home/road splits have been archived extensively across various platforms, but they especially show up when the Steelers play an early-window game. As Rotoworld's Rich Hribar has mentioned in the past, Roethlisberger has now been inside of the top-10 in QB fantasy scoring in just two of his past 23 road games with early start times (1 p.m. EST) over the last five years. The Steelers' quick-pass scheme against the blitz neutralizes the effect of sending multiple pass rushers, allowing Roethlisberger to quickly find his (new) big three of Brown-JuJu-Conner. Whether or not Baltimore adjusts and either disguises their blitz packages or they simply send the house less often will be an important piece in this Week 9 chess match. Regardless, Baltimore has done an incredible job at limiting Big Ben over the last four seasons. 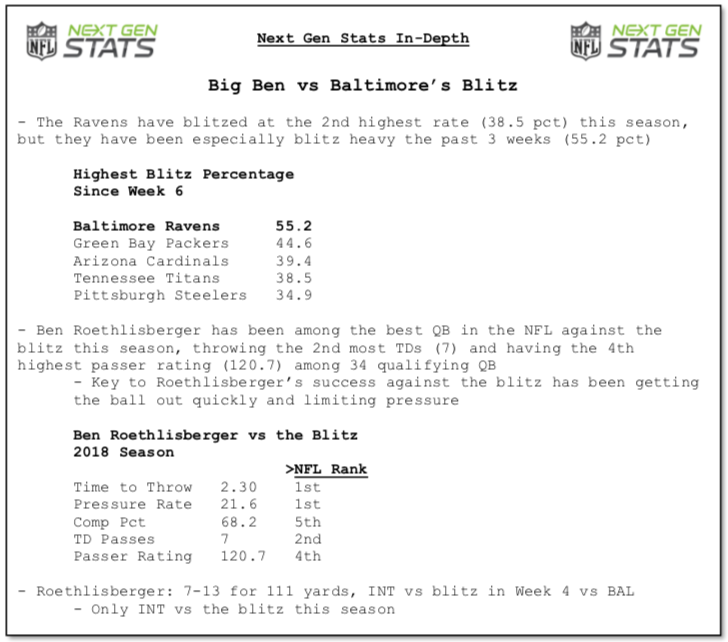 In his last six meetings with Baltimore, Roethlisberger owns an 8:7 TD-to-INT ratio, he's averaged just 6.8 YPA, and his passer rating is an uninspiring 80.7. Key matchup: How do the Bills survive? Now forced to turn back to "QB1, Nathan Peterman" since Josh Allen (elbow) and Derek Anderson (concussion) are on the shelf, the Bills are in trouble ahead of their home date against the Bears. Peterman's 11.1 percent career interception rate is the third-worst figure ... of all-time. His career passer rating is 31.4 on 81 throws. Meanwhile, Chicago is holding enemy signal-callers to a 3.8 percent completion rate below expectation (fifth-best rate) and their secondary is allowing the second-fewest wide open throws (five or more yards of separation) at just 15.9 percent, per Next Gen Stats. The only thing that could make Chicago's D/ST a better play in Week 9 is if this game were at Soldier Field. Of course, we must take this one step further. It's easy to make quick assumptions when the sample is small, but even if we go back and add the 2017 season -- it's hard to make a case for Winston over Fitzpatrick. Over the last two years, Fitzpatrick owns a 6.4 percent TD rate, 8.7 YPA, and a 104.4 passer rating when throwing from a clean pocket, per Next Gen Stats. In this same span, Winston's TD rate from a clean pocket (4.1 percent), YPA (8.3), and passer rating (96.5) all trails the veteran, Fitzpatrick. For context, Winston has thrown into a tight window on 20 percent of his passes from a clean pocket over the last two years while Fitzpatrick is at 16.7 percent. Now, 'Fitzmagic' is back to face a Panthers secondary that has allowed a 2.5 percent completion rate above expectation (seventh-worst) and a 55 percent passing success rate (tenth-worst) since their Week 4 bye. The "Tampa Bay QB", regardless of who is starting, has finished as fantasy's QB1, QB6, QB4, QB23 (vs. Chicago), QB1, QB6, and QB1 in weekly output this year. The Browns just have zero luck. Cleveland finally fired Hue Jackson after he went 3-36-1 in 40 games and their first contest under interim head coach Gregg Williams is ... against the Chiefs. Good luck! Trying to find something original to say about Patrick Mahomes is nearly impossible at this point, but the Browns are in serious trouble this week. Under Gregg Williams, Cleveland blitzes on 34 percent of dropbacks -- the third-highest rate in the NFL. The Browns must find a way to force Mahomes to hold the ball in the pocket because the 'Air Reid' offense turns into an efficient butcher's knife when Mahomes gets the ball out quickly. This year, no quarterback has a better passer rating (137.1), completion percentage (82.4), yards per attempt (9.6), and TD-to-INT ratio (12:0) on quick throws than Mahomes. Next Gen defines a quick throw as any attempt that takes 2.5 seconds to release. Look for the Chiefs to release a bunch of quick-hitters to neutralize the Browns frenetic pass rush in Week 9. At long last, Kenyan Drake is finally being used properly in the Dolphins passing game. In the opening four weeks of the season, the shifty back only saw 3.5 targets per contest and tallied just 10/55 receiving. Since then, Drake has averaged 6.8 targets per day and has compiled 17/142/2 through the air. What's most impressive about Drake's turnaround in the receiving department is that Miami is not necessarily deploying him in any special way. Per Next Gen Stats, Drake is running 88 percent of his routes out of the backfield. Instead, Miami is just shoveling opportunity to Drake, as his 89.6 air yards over the last four weeks trails only Tarik Cohen (105.8) and James White (92.8) for the league lead among RBs in this span per Next Gen. Now, Drake faces a Jets front seven that has allowed 7.33 yards after the catch per target to enemy running backs over the last six weeks, the eighth-highest clip in the league in this span. Now that Golden Tate is in Philadelphia, both Marvin Jones and Kenny Golladay are set up well for larger roles over the second half of the season. Tate was averaging 27 percent of Lions' targets over Weeks 1-8, parlaying 6.3 receptions and 73.9 yards per day on his voluminous 9.9 targets/game. In the duo's first game without Tate, they'll have to face a Vikings' secondary that has stiffened over the last month. Through Weeks 5-8, Minnesota held the Eagles, Cardinals, Jets, and Saints to a combined 71.4 passer rating (third-lowest) and a 4.1 percent completion rate below expectation (tenth-best). Marvin Jones in particular will face shadow coverage from Xavier Rhodes on the boundary, who is once again playing at an all-pro level. Among cornerbacks that have faced at least 20 targets when they are the nearest defender in coverage, Rhodes' 69.1 passer rating allowed is 15th-best. Rhodes is allowing a paltry 5.53 yards per target, too (14th-best). On the flip side, Kenny Golladay draws the Lions most advantageous matchup. Golladay will run the majority of his routes on Trae Waynes' side of the field, where the Vikes' corner has permitted a 100.6 passer rating, 8.81 yards per target, and a 7.0 percent catch rate above expectation when he's the nearest defender. After catching just three passes in Weeks 7-8, Golladay is in a scenario for success in Minnesota. Now, Peterson can extend his streak of 90-plus rush yards to four games if Washington can keep the game tight versus Atlanta's high-flying attack. On the year, the Falcons have allowed a rushing gain of 10 or more yards on 14.6 percent of carries (third-highest rate) and they're second-worst in success rate allowed (57.3 percent). Atlanta is widely known as a leaky unit against receivers out of the backfield, too -- and Peterson may be in line for a few more pass routes if Chris Thompson (ribs) remains limited. With Thompson completely out or limited in Weeks 6-8, Peterson has played on 56.6 percent of Washington's snaps after playing on just 40 percent of team snaps in Weeks 1-5. One of the great things about Next Gen Stats is that we can quantify just how good a player is relative to the rest of the league. Perhaps one of the most illuminating metrics in this regard is completion probability, which is the likelihood anyone pass is completed based on Next Gen Stats in-play data. As you could imagine, DeAndre Hopkins smashes in defying catch probability statistics. This year, Hopkins has posted an insane 12.7 percent catch rate above expectation -- the second-best clip in the NFL. Hopkins specializes in making contested catches, especially relative to the rest of the Texans team. When Deshaun Watson targets anyone other than Hopkins, his completion percentage dips 2.7 percent below expectation. Now that Will Fuller (ACL) is out for the season and newly-added Demaryius Thomas may need some extra time to learn the offense, DeAndre Hopkins will shoulder a huge Week 9 load in Denver. Since Fuller joined the league in 2016, DeAndre Hopkins has averaged 12.3 targets per game (36% share) without Fuller in the lineup versus 9.9 targets per game (27% share) with Fuller active. This week, Hopkins faces one of his toughest tests yet against a Broncos secondary that is stifling boundary production to receivers. This year, the Broncos have held wideouts to a 5.4 percent completion rate below expectation. Hopkins runs 83 percent of his pass routes split out wide from the formation. Key matchup: Can Russell Wilson stay hot in Week 9? The Seahawks have been the most run-heavy team in the NFL over the last three weeks, but that has not stopped Russell Wilson from absolutely dominating. In this three-game span, Wilson's numbers look like they are from Madden: 44-of-61 passing, 660 yards (10.8 YPA), 9:1 TD-to-INT ratio, 140.0 passer rating, and a 15.6% completion rate above expectation. Wilson's efficiency is especially present in the red-zone, where he is tracking towards one of the most prolific passing seasons ever. Right now, Wilson is on a similar touchdown trajectory as Deshaun Watson was last year. Wilson's 45.8 percent passing TD rate in the red-zone trails only Watson's scoring clip (48.2 percent) for the best rate since 2000. The 'Bolts secondary struggled to start the season, but they've since corrected over their last four games. In the month prior to their Week 8 bye, L.A. held enemy passing attacks to a 72.9 passer rating (second-best in this span). DE Joey Bosa (foot) is not due back this week, but the Chargers will be cooking with gas when returns shortly. In the meantime, Wilson and the Seahawks white-hot aerial attack will surely be put to the test as Casey Hayward, Trevor Williams, Desmond King, and S Derwin James are really rounding into form. There are countless angles to break down in this epic NFC battle, but one of the most intriguing matchups lies in the backfield ... but not in the way of production on the ground. 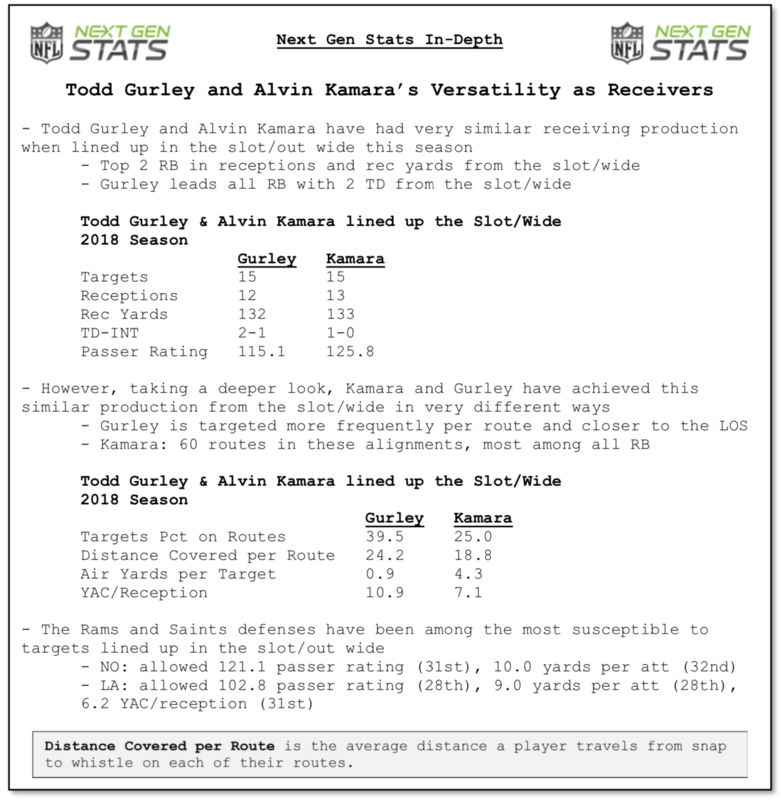 Todd Gurley and Alvin Kamara are arguably the NFL's most dynamic receiving backs, as head coaches Sean McVay and Sean Payton utilize their backs' skill-sets in a dynamic way. On the year, 36 percent of Gurley's total targets have come when he's split out wide or in the slot while 24 percent of Kamara's passing looks have come from the same alignment. Rather perfectly (for fantasy football purposes), the Saints and Rams' defenses both struggle enormously to receivers lined up out wide/in slot -- allowing the NFL's second- and fifth-worst passer rating, respectively. New Orleans arguably has the best run defense in the NFL -- they are allowing the lowest YPC and the sixth-lowest success rate to enemy ground attacks -- but Gurley will continue to make hay as a receiver in Week 9. It's incredible that this is just the second meeting ever between two GOATs. In another weird scheduling oddity, Joe Montana and Dan Marino only met one time in NFL history, too. We should make up for lost time in Week 9, though. Since this is the clear marquee matchup of the week, I thought it best to change up this section a bit. 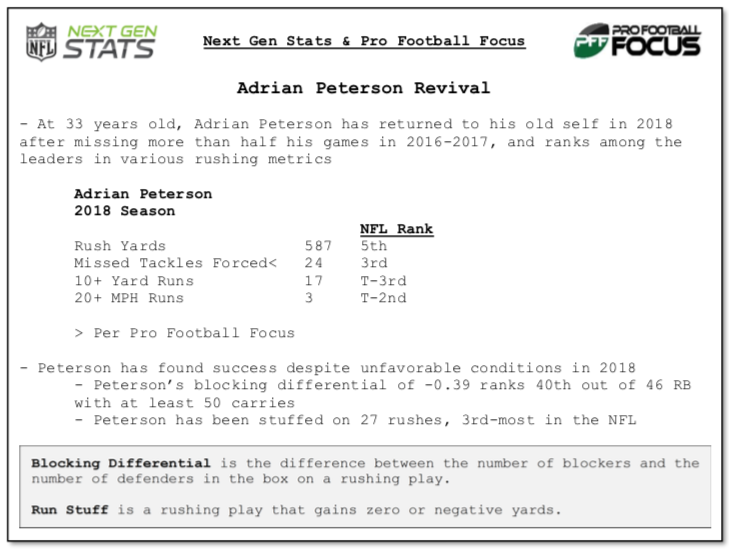 Next Gen Stats' data is truly unique and does an impeccable job contextualizing what we see on the field. Instead of writing multiple paragraphs just telling you what you already know -- Brady and Rodgers are incredible -- I'll let the data do the talking. Key matchup: Can Amari Cooper immediately make an impact? At long last, the Cowboys finally have what they view as a No. 1 receiver. Since Dez Bryant's 2014 season (88/1,320/16), Dallas has essentially elected to punt the receiver position as Bryant struggled through various injuries and the team did little to change their receiver personnel. That all changed post-Week 7 when Dallas moved their 2019 first-round pick to Oakland for Amari Cooper. On the surface, the trade for Cooper shows little equity for Dallas. The league's best slot receiver, Golden Tate, was just traded for a third. The still-productive Demaryius Thomas was flipped for a fourth and physical-freak Josh Gordon was had for the bargain bin price of a fifth-rounder earlier this season. Regardless of trade semantics and value, Cooper will immediately help a receiver room that's struggled to consistently gain separation. Per Next Gen Stats, the Cowboys are dead last in yards of separation at the target point (2.2) while Amari Cooper has done an excellent job getting open when split out wide (3.75 yards of separation) and in the slot (3.86) this year. Dallas would be wise to use Cooper as a movable chess piece in their attack, instead of just playing him strictly as an "X" receiver as they did so frequently with Dez Bryant (85 percent of his routes were out wide from 2015-17). Dak Prescott desperately needs a reliable, explosive target and even though Cooper's production doesn't reflect it -- this has been his best season yet, by far, in Next Gen's separation metrics. Hopefully, Cooper's addition breathes life into Dallas' pass attack that is fourth-from-last in passing yards per game (183.1).